the spout will not drip. This is very helpful advice. Peterson and Casson also point out, as many of us have heard from one source or another, the importance of a sharp edge. Yet I believe Rhodes' statement about the direction of the spout is often ignored and is what gets most people into trouble. In my opinion, his remarks about direction, however, need a little expanding to assure no-drip, dribble-free spouts. In my experience, the direction of the end of the spout, when the pot is full, tilted slightly, and just starting to pour, needs to be horizontal or pointing slightly downward. This is illustrated in the drawing above. 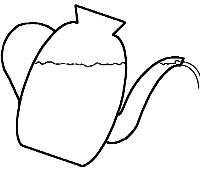 As you look at this illustration, think about what is going to happen if the spout shown were cut off at the lower arrow instead of being the length and curvature illustrated. It is not hard to visualize that the stream of liquid would split into two parts, with some going where it was intended, and the rest dribbling down the surface of the spout. In the simplest terms, this is just gravity doing its job. John Hesselberth is a retired chemical engineer with a strong background in fluid mechanics. He now makes pottery full time in his West Chester, PA studio. Comments may be sent to John c/o Clay Times, PO Box 365, Waterford, VA 20197. Copyright ©1997, 2008 Clay Times Inc. All rights reserved.